They are all over the world, but there is no higher concentration of flower parades than in the “Netherlands”. 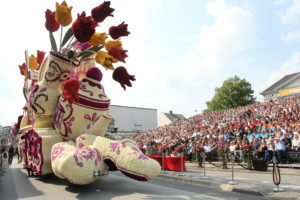 Belgium counts six flower parades, in the Netherlands there are about twenty. Each with their own charm and character. Flower parades are an old tradition, that is carried forward from father to son, mother to daughter and vice versa. At the same im the tradition evolves, and changes, depending on new customs. The parades currently held, cannot be compared to the ones fifty years ago. Lichtenvoorde, Valkenswaard, Eelde, Vollenhove, Tiel, Sint Jansklooster, Winterswijk and Drogeham. 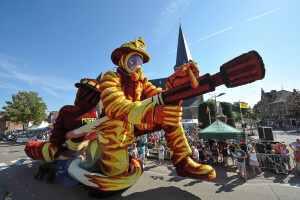 The Flamish parades of Blankenberge, Loenhout, Sint-Gillis-Dendermonde, Wommelgem, and Ternat made a joined effort, and were recognised on the Flamisch list in 2013. And last but not least the Battle of Flowers of Laredo is recognized as intangible heritage in Spain since 2011. 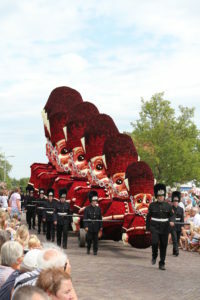 This group of Flamish and Dutch flower parades, are now joining their efforts for a spot on the Unesco Representative list of the intangible cultural heritage of humanity.